Carlos Acosta is the subject of an upcoming episode of the BBC's 'Imagine...' to be aired on BBC One on 8 December 2015 at 10.35pm GMT. The documentary film — presented by Alan Yentob — will follow the Principal Guest Artist of The Royal Ballet in the lead up to the recent world premiere of his new production of Carmen, which Carlos both choreographed and starred in. Carlos' adaptation of the classic tale took inspiration from Bizet's iconic opera, incorporating memorable tunes including the Toreador Song and featured The Royal Opera Extra Chorus. The final night of the 2015/16 run marked Carlos' final main stage performance with The Royal Ballet at Covent Garden. The programme will also look forward to his future plans of establishing his own dance school in his native Cuba. 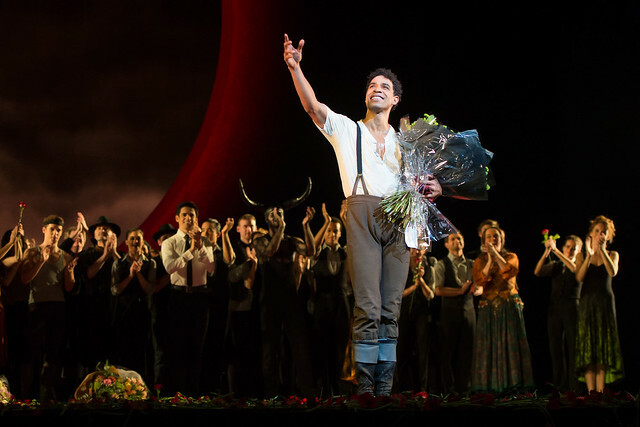 In addition to this 'Imagine...' special, Carlos Acosta's Carmen will be broadcast in full on Christmas Day at 7.30pm on BBC Four. Further details of other ROH broadcasts over Christmas 2015 will be announced in due course. Imagine… Carlos Acosta: Cuba Calls will be broadcast on 8 Dec at 10.35pm on BBC One. Great news. It will be lovely to hear more of Carlos' plans. I know I am going to greatly miss seeing him perform at ROH. It has been a real pleasure and privilege to see so many of his performances and I will treasure the memories of these. Very much looking forward to the programme. Am sure it will be excellent. Perhaps with Carlos 'retiring' from ROH it would be a timely moment for a repeat of The Royal Ballet In Havana programme which I missed first time round. Is the Christmas day broadcast the full mixed bill programme, or just Carmen as an extract. Or will we have to wait and see. The mixed bill was fantastic, with Carmen the icing on the Christmas cake. Delighted that Carlos's Carmen will be shown on BBC4! Will this include the farewell speech that was shown in the cinemas? I was unable to see the live broadcast. We will all miss him at the Royal Opera House. Having been at the Royal Opera House for the final performance and then having seen it again at the cinema encore screening, I'm very much looking forward to this special treat on Christmas Day. I hope the full production of "Carmen" will be shown, including the final curtain call, with the speeches by Kevin O'Hare and Carlos, and also Carlos's little daughter, Aila, coming onstage. That was very emotional!! Even though that final main stage curtain call is available to view on YouTube, I think it would be much appreciated by British audiences on Christmas TV. It would be a VERY special Christmas Special! Can I buy this dvd? As this was a BBC production the decision to release the programme on DVD would rest with them.